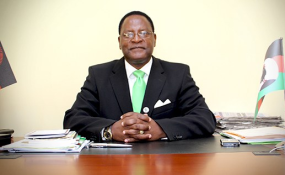 Malawi Congress Party President Lazarous Chakwera. Main opposition Malawi Congress Party (MCP) has told Minister of Homeland Security Nicholas Daus to apologize and resign from his position following his remarks that attacks on people with albinism has not reached crisis levels. Dausi said at a news conference this week that the attacks on persons with albinism were yet to get to levels where they should hold vigils at State House or seek asylum in other countries. A video clip with Dausi remarks has gone viral on social media attracting wrath of many Malawians. Dausi said: "When they say they want to seek asylum elsewhere, do they want to insult government? Seriously? If they [Apam] are listening to us, will they insult government? These are things coming from homes where parents are selling their biological kids and they say we are facing challenges here? "Even if there could be a country with tight security, but if a mother is selling her own child, a young man is selling his uncle right in the homes where there is supposed to be tight security. Now they say they want to march to State House, what will they be marching for?" But MCP spokesperson Reverend Maurice Munthali said the remarks by Dausi were irresponsible, childish and careless. "Honourable Dausi does not fit to be a Cabinet minister, especially of Homeland Security. He needs to apologize to the people with albinism and then resign. This is embarrassing," Munthali told Nyasa Times. Dausi said his remarks were not meant to belittle persons with albinism and insisted that the issue was being politicised. This comes barely a day after key subject in the abduction of the 14 year old boy with albinism suspect died in police custody raised suspicion in the way the government is handling the matter. The Association of People with Albinism in Malawi (Apam) has also not taken the minister's sentiments kindly, arguing that Dausi demonstrated a lack of seriousness in fulfilling duties and responsibility to protect persons with albinism. Apam plans to hold a three-day vigil from March 6 to 8 2019 at Kamuzu Palace. The vigil is scheduled to be preceded by a solidarity march from Lilongwe Community Centre ground through Parliament Building to Kamuzu Palace where they will present a petition to the President.